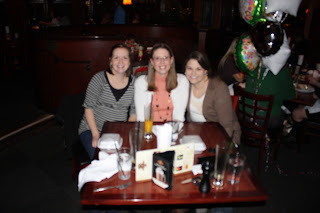 Pardon the blurry picture, this is the best the waiter got. Last night, we went out for a wonderful girl's evening. and a big finale finish with ice cream and people watching outside 7Eleven. one of the few times we had left to hang out together before we leave. We've had so much fun having our little families get to know each other. I'm going to miss these girls SO much. It makes me teary just thinking about it. But, we'll be back to visit and I have no doubt this will not be the last girl's night. It's Friday! Yeah! I'm hoping to get some extra sleep this weekend, as well as doing some Christmas shopping and packing and maybe some scrapboking. I'm just not ready to pack my scrapping stuff up yet. Sounds like a great time! Although the people watching outside 7-11 is a bit questionable, LOL! No not questionable...AWESOME! Couldn't believe all the interesting people...especially the cops who dined and dashed while sucking on mustard packets, and the classy girl with tattooed knees. Best Thursday night in a while! Thanks ladies! yeah!! Girl time is fun! I'm so sad your leaving!! When are you moving? I want to come and say goodbye! !